So what was I doing there? My research is on the history of development interventions by UN agencies, aimed at people with disabilities in Tanzania and Kenya. I can certainly relate my subject to human rights, being part of a project that aims at unravelling how disability rose to the mainstream of international human rights discourses. But humanitarianism? I must admit that I did not have a clear idea about what humanitarianism entails before I joined this academy. During the two weeks of discussions and lectures however, it soon became clear that maybe no one has, or at least that different people have very different ideas about it. Certain themes and concepts nonetheless consistently appear throughout different writings on the history of humanitarianism, and I can certainly relate my own research to them: fostering sympathy across borders, mobilizing people through transnational organizations, lobbying for state interventions, and especially the relief of ‘the suffering of distant others’. It thus became clear that looking at my research through the lens of humanitarianism might be a fruitful exercise. I was however equally intrigued by the questions whether and what a disability perspective could contribute to the history of humanitarianism. It was mainly during the second week of the academy that I started to formulate a preliminary answer to these questions. It is really this second week that sets the GHRA apart from any other, more traditional ‘summer school’. We spent this week in Geneva, mainly at the headquarters of the International Committee of the Red Cross (ICRC). There was a mixture of lectures by senior ICRC staff members and research time, spent either in the ICRC archives, the library or any of the other international archives that Geneva has to offer. Since the ICRC has only opened its archives until 1976, I focused on the collections held at the library and at the audiovisual archives. There, I discovered the history of the ICRC’s involvement with disability, a history that points us to the unique perspective disability can offer to the history of humanitarianism. The ICRC has been involved with assistance to the so-called ‘war-disabled’ since the Second World War. 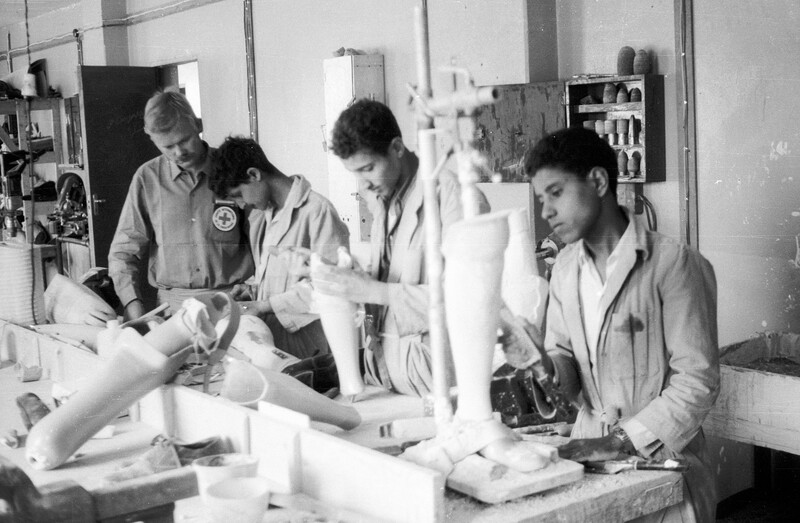 In the aftermath of this war, it launched several programs for physical rehabilitation in different countries (Finland, Algeria, Hungary, Nigeria, Vietnam, etc.). These were mainly orthopedic programs, that revolved around the manufacture and fitting of artificial limbs, and the subsequent physical rehabilitation of people disabled by war. Over the years, the ICRC slowly realized that their interventions were problematic – especially for the so-called developing countries – since they relied on techniques and materials imported from highly industrialized countries. To counteract the dependency that this kind of approach created, the ICRC shifted its policy in the 1970s. Their new approach was first tested in the orthopedic center of Sanaa in Yemen, and was based on local materials and labor resources. This meant a shift away from import-based interventions, towards the training of local specialists and the use of local resources. The Yemen project became a model for later projects. In 1979, the ICRC set up a Physical Rehabilitation Service. Two years later, at the end of the International Year of Disabled Persons in 1981, the Twenty-fourth International Red Cross Conference at Manila adopted a resolution for the creation of a Special Fund for the Disabled, which was established in 1983. It was specifically designed for the support of long-term projects. Over the years, the assistance also shifted from focusing only on direct victims of war (i.e. people directly injured by war violence), to include all victims, direct and indirect. In their own words, “the primary aim of the ICRC’s physical rehabilitation programme is to help disabled people who are affected by the conflict or war reintegrate into society, socially and economically, both during the period of ICRC assistance and afterwards”. It is this last part that points to the complexity that the issue of disability offers for an organization that primarily focuses on emergency relief: how long do you stay? And what happens after you leave? In describing the ICRC’s activities in the field of medical care for the ‘war disabled’ in 1987, the Chief Medical Officer of the ICRC recognized this problem, stating that when it comes to interventions on disability, “contrary to its usual practice, the ICRC has to set up programmes which go beyond its self-imposed emergency criterion, since the situation calls for long-term treatment involving a development project”. Here, the boundaries between humanitarianism and development become blurred. It is no coincidence that after two years the Sanaa center was handed over to the World Health Organization, an organization at the very center of my own research on disability and development, which was involved in long-term rehabilitation projects. All of this points to the challenges that disability poses to both historians and practitioners in the field of humanitarianism. Disability can not be reduced to a personal tragedy, to be overcome with the help of medical professionals. Disability is a societal issue, prompting us to ask questions about how a society deals with its ‘others’ – which are not just ‘suffering others’ as humanitarian discourse would have it. Disability clearly shows the very long-term effects of war and disaster, and how tackling these effects involves much more than ad-hoc emergency relief. Therefore, as this very concise history shows, disability has pushed humanitarians to rethink their practices, just as including disability in historical research can push historians of humanitarianism to rethink their practices. This entry was posted in Actualités / News, Articles and tagged GHRA 2017, Humanitarianism, ICRC Archives by Fabian Klose. Bookmark the permalink.